First Listen: Yusuf/Cat Stevens, 'Tell 'Em I'm Gone' The singer, formerly known as Cat Stevens, tackles weighty existential questions by looking backward, using the blues to unlock buried memories. 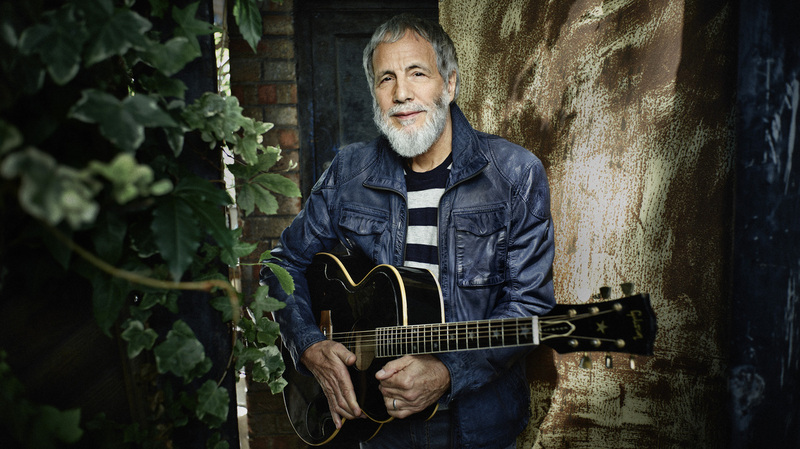 Yusuf's (formerly known as Cat Stevens) new album, Tell 'Em I'm Gone, comes out Oct. 27. The song's inherent ambiguity — is it aimed at a person, a deity, the life-giving sun? — makes it an interesting cover choice for Yusuf (formerly Cat Stevens), a noted seeker and sometime mystic who for a long stretch of the 1970s ran pop's most lucrative spiritual outpost. It's not the kind of song Cat Stevens would have performed; it's too blunt, too winsome. But things have changed, and on his latest foray into pop, the 66-year-old singer attempts different modes of expression. Yusuf was inducted into the Rock And Roll Hall Of Fame earlier this year, and Tell 'Em I'm Gone, his first album since 2009's Roadsinger, situates his introspection inside unexpectedly sly and easygoing takes on blues and roots music. Split evenly between covers and new originals, it's an album-length evocation of the music that first galvanized Yusuf: the American blues and R&B that captivated London in the early 1960s. But Tell 'Em I'm Gone, produced by Yusuf with help from Rick Rubin, is hardly a straight-up homage or autopilot nostalgia exercise. Its originals sometimes draw on song forms common in folk and bluegrass, and its narratives are laced with characteristically sharp observations about faith, spirituality and the mysterious guises of truth. Meanwhile, "You Are My Sunshine" and the other covers — many built around the crisp backing of Tinariwen, the band of Tuareg desert-wanderers based in Mali — manage a rare trick, infusing the overused cadences of the blues with a sense of higher purpose and pronounced spiritual seeking. Yusuf's "You Are My Sunshine" is a subtle reworking, with a firm Memphis backbeat and a bit of the hardworking show-business panache Joe Cocker used to bring to his covers. Yusuf starts by personalizing the chord sequence slightly, adding tension-making passing chords. Curiously, when it comes time to sing the song's signature heaven-reaching line ("You make me haaa-ppy"), he avoids the official melody entirely. It's a deliberate detour, and it takes the song out of church while slightly tempering its exuberance. To sell this alteration, Yusuf has to depart from his customary sweet-and-tidy phrasing to communicate in a rawer, earthier way. You can tell from the grit in his voice that this is not a moment of serene meditation. Things are unresolved. Even life's simple pleasures, like warmth from a blissed-out sun, may disappear at any moment. This has always been one of Yusuf's great skills: making abstract matters of the soul seem of great consequence to the next breath. Yusuf's guiding idea for Tell 'Em I'm Gone — tackling weighty existential questions by looking backward, using the blues to unlock buried memories — is clear. He opens with a crystalline miniature, "I Was Raised In Babylon," that re-confirms his gift as a pop sage; the first verse ends with a caustic observation about how the third world views the first world. ("They used to call us civilized / Those days are gone.") Then comes Jimmy Reed's "Big Boss Man," a swaggering shuffle that's one of several subversive comments on income inequality. Then Yusuf performs a piano-anthem version of Edgar Winter's "Dying To Live," which has elliptical zen-koan lines ("I'm trying to give, so why don't you give me a try") that resemble many Cat Stevens singles. Throughout Tell 'Em I'm Gone, Yusuf avoids most of the aging-rocker comeback pitfalls, notably lyrics that amount to tedious variations on "Those were the days." His reworkings of old songs, like Procol Harum's "The Devil Came From Kansas," exhibit welcome irreverence and a willingness to stretch. And when Yusuf looks back, in autobiographical originals like "Editing Floor Blues" (which features whiplash harmonica from the legendary Charlie Musselwhite), he does so with an unsparing eye. Yusuf is not peddling his own errors; instead, he revisits past mistakes as though determined to learn from them something about how to move in the present. "There was a time, a long way back / when I would fall for any dog trap," he sings in the tightly harmonized "Cat And The Dog Trap," in that calm, endlessly reflective voice. That tune is perhaps the moment on Tell 'Em I'm Gone that's closest in spirit to such '70s gems as "Father And Son" — if you ever longed to hear what the son in that song might say, years later, to the father, one possible account (among an infinite many) is here. In that track and elsewhere, what comes across first and foremost is the sense of a search, or many searches, in progress. The ruminative soul who immortalized (and in a sense legitimized) the act of searching itself, with songs like "On The Road To Find Out," is still out there and still seeking. Maybe he's not finding blinding illuminations to share every time out. But, hey, the bluesmen he loves didn't, either. They just told what they knew at the time and kept going. It's been too long since this truth-teller shared like that, and it's nice to have him back.